I illustrated this pillow cover using a combination of collage and watercolor then had the artwork digitally printed onto cotton linen fabric and finally sewed it into a cushion. A cool throw pillow, it makes for a modern update to a sofa, or bedroom and is a quick, hip way to accessorize your home with pattern and art. A great gift for interior design lovers. Pillow measures 16"square, has a removable Polyfil insert and a zipper closure sewn into the bottom. The pillow has my custom designed fabric on one side and a lovely beige, recycled cotton canvas on the back. To wash, simply turn the artwork inside out and wash on your machine's cold water settings with phosphate free detergent. Each pillow is made and printed to order and takes approximately 2 weeks to ship. Please let me know if you need a faster shipping method than USPS Priority Mail. In my own home, I'm always on the hunt for the perfect pillow and have never been able to find exactly what I've wanted, so I created these with my own designs. 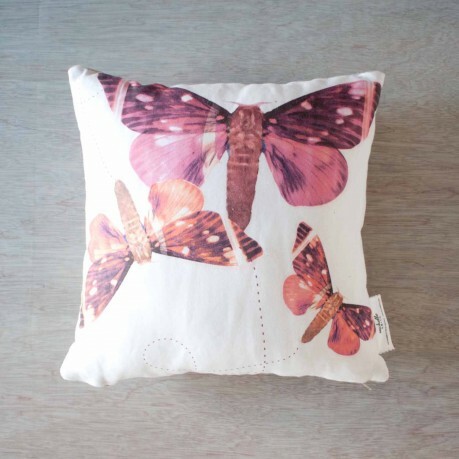 I'm a textile lover and seeing artwork on pillows is striking and brings a smile to my face.